Well well it is finally that time of year when all the monsters come out to play their Musical Instruments and scare up some Halloween fun!! Welcome To The Annual Monstermash Rehash!! 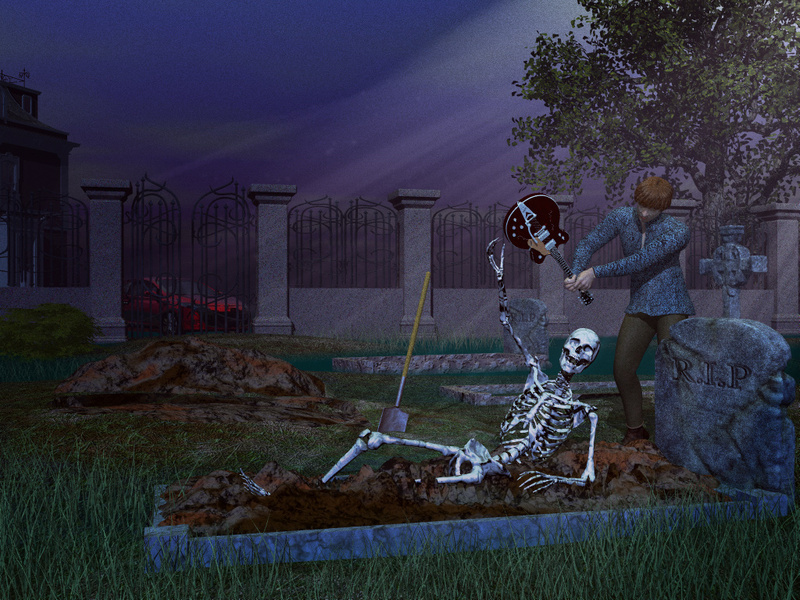 This year I wanted to have some fun with Fall and Halloween, so we came up with this theme. I saw all the requests for a rehash of the oldie halloween bash Monsters And Music, so I decided to invite you all to a new version of it. I want us all to have some real fun with this theme, so get your thinking caps on (I am sure you already have a thousand different thoughts) and get those renders popping out of your head. In your entry, you must have at least one monster, or person in costume, and one musical instrument or music player of sorts. Hey ya'll. Just decided to peep in to see what's been going on... I must have scared everyone away again! Perfect for Halloween, ya? Hey there Skywalker so nice to see you popping in I do hope you will stick around and join in the fun!!! NAE (Not An Entry) - just an alternative poster (or two) and banner for "Monsters And Music". Note to self: Do not delete the images from this post as other people may be linking to them ! 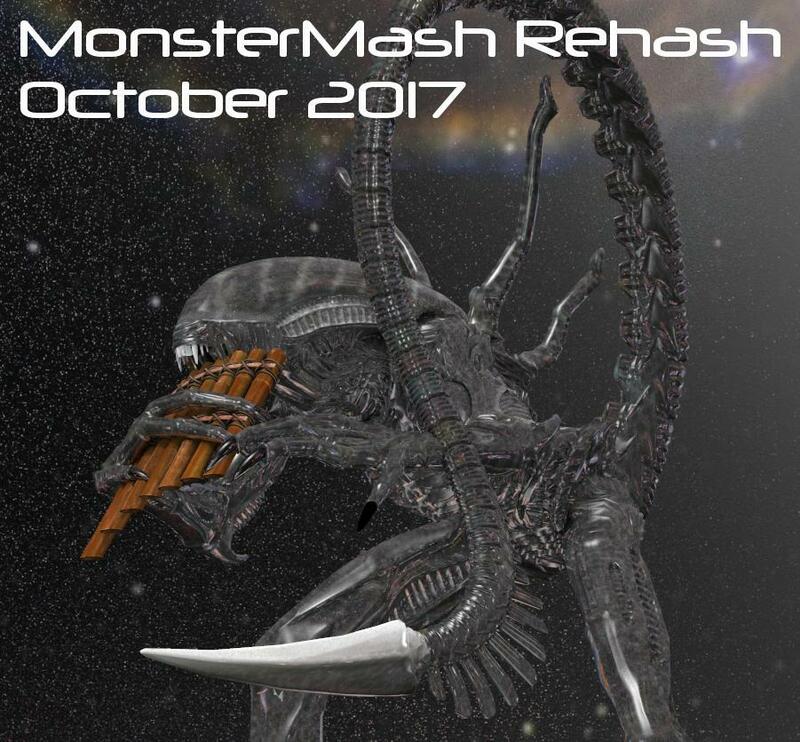 Edit: Main poster now posted to my gallery with the tags monstermash and monstermash2017 (I was surprised to see that nothing comes up if you do a gallery search for monster mash). If anybody else posts their images to their gallery can I suggest that you also add the tags monstermash and monstermash2017 ? I must admit that I for one do prefer that poster an banner, much more artisitc. I don't see any point in changing the title thought, it's fine as it is. One I've wanted to do for years for the original MMHB, but never got done, is now more appropriately timely with the passing of Mr. Tom Petty: I'll try to do one myself, and am offering a free copy of either or both of my Noir comic-book shaders to whomever else does an entry this month based on his song "I won't back down". All the usual rules for the contest also apply. hi everyone... long time no see! NAE from past monster mashes bet you don't need the song titles that go with them. the first one was a 1st place winner and also was featured in 3D Hobby magazine, the second was not a winner but a personal favorite. I do hope I have not offened anyone due to the resent events in real life!! Now I hope we can get back to having fun with this years theme!!! Hi everyone.. This is my first challenge, i hope everything is right. Here is my RAW- picture without postwork.. Welcome to the Freebie Challenge Jasco, great render!!! It is nice to see some new and old faces in the challenge!!!! Ok Jasco plz move the entery and post work over to the Entries Thread all together with all the links on the same posting with the 2 renders. Nice work Jasco! Looks like a cover of a heavy metal album... wait do they still have those? No they do not it would be on the cover of a CD case these days lol. Thanks Saphirewild for the instructions and help! Picture is in Enteries Thead for judging. Thank you Jasco for putting it all together in the enteries thread. Thanks Chohole for sharing that great render of that famous song Get back By The Beatles!!! I think the remaining members would have a good laugh at that one, Chohole! A lot of Daz freebies recently have been textures for outfits that must be purchased. How does that fit into the rules of the contest? You put the outfit in the paid part of your listing then under the freebie listing you put the texture set. So sorry I have not been around for a couple of days been so sick with a major bad head cold. I sure hope you are all getting ready those fun musical Monster renders!?! ?